Pegasus Airlines 4 Boeing 737-800 NG have gone back to Turkey after completion of their wet lease tenure. And PIA has decided about the latest wet lease tender for narrow bodies. As many as 06 planes were offered by 2 airlines for April May 2017 tender that sought narrow body planes for PIA. Top of the list are 4 Airbus A320s, offered by Vietnam’s low cost airline Vietjet and offer of 2 Boeing 737-800 came from Malaysian low cost airline Malindo Air. Malindo is recently rebranded as Batik Malaysia. VietJet Air is owned by Sovico Holdings, HDBank, other organisational investors and individual stakeholders. While Malindo Airways is a Malaysian low cost airline with headquarters in Petaling Jaya, Selangor, Malaysia. The name Malindo is derived from the names Malaysia and Indonesia. The aircrafts offered by Vietjet Aviation are all A320-214 that are powered by CFM engines and the oldest out of the four isVN-A695 that took to skies for the first time in 2008 for Cebu Pacific and then in October 2014 it was delivered to Vietjet Air. It was leased from CIT. Then comes VN-A689 and VN-A699 which took to skies in January 2010 for Olympic Air. These were delivered to Vietjet Air in November 2012 leased from Alafco. The best out of the lot is Airbus A320-214 that was delivered to Vietjet Air in mid May 2016, receiving 86.4 marks. These all aircrafts got 86.4 to 83.6 marks. Malindo Airways presented two Boeing 737-800 both with CFM international engines. The 9M-LNZ was delivered directly to Malindo on 14 may 2016. While the other aircraft 9M-LNM was also delivered directly to Malindo on 5 October 2014. 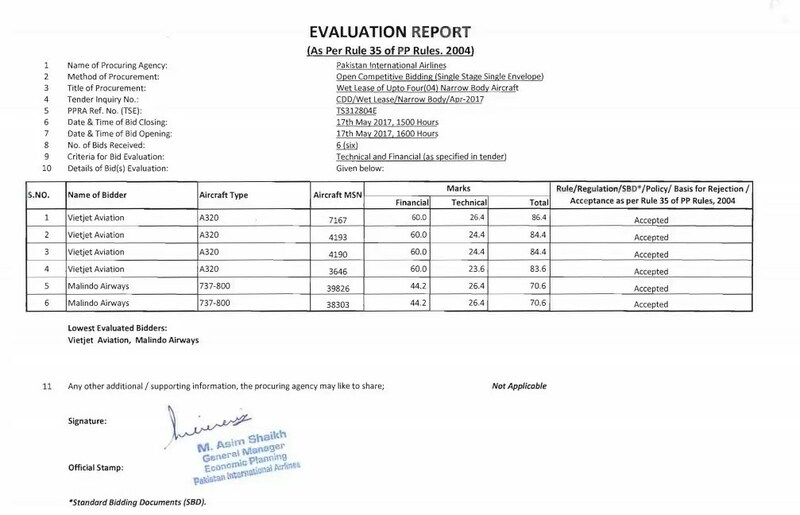 Malindo aircrafts got lowest marks on 70.6 in the evaluation. It is highly possible that PIA might go for 2 A320s of Vietjet Air because it currently flies Airbus A320s as its main narrow body fleet option. These aircrafts are sought for 3 months but there is an option to extend the lease to further 3 months.